A Mini Family Reunion in Gridley! I was itching to get back on the road again, if only for a couple of days and a single night. Gale and John’s daughter, Jill, and husband Craig, would be visiting from La Pine, Oregon over the weekend and we certainly wanted to see them. We saw Gale and John’s son, Kevin, our last visit. After my efforts cleaning the coach inside and out over the prior week, we loaded the coach that Saturday morning and headed north. The so-called “Camp Fire” was raging just 28 miles north of Gridley and had essentially erased the town of Paradise in recent days. The fire covered the valley in smoke. From home all the way to Gridley smoke hung in the air everywhere. Jill and Craig intended to drive into Chico, CA en route to Gridley from their home in Oregon, but the fire had closed their intended road and they had to continue south on I-5. During our drive north we were passed by perhaps a dozen CHP vehicles as they raced toward the raging fire near Paradise, CA to back up the local sheriff’s office and help with traffic control. Here four of them zoomed by. Note the fog-like conditions created by the ever present smoke that hovered during our entire drive. The drive was so smokey that most photos I took were not fit to post here. Still, I have posted a few photos of the drive and each one was a bit hazy due to the smoke. This Blue Heron flew across the road in front of us, and was startled by Big Blue; he flapped hard as he could to gain elevation and I was lucky enough to have the camera in hand at that moment. Here he is under great stress as he cleared the coach. He pooped in the process and I had to clean the front of the coach when we arrived! This swan just happened to stretch his wings wide as I shot this group of waterbirds in a flooded rice paddy. This shot was pure luck on my part! This is a cold storage facility on SR99 south of Live Oak, CA. The place is essentially deserted this time of year, so we pulled in like we owned the place and whipped up lunch aboard. We found yet another Dale’s Diner in the middle of nowhere! We backed into Gale and John’s driveway about 1300 hours. I spent a while setting up the coach for our stay as Lavonne headed to the house to begin her visit with Gale and Jill. Big Blue became our cozy apartment for the stay at Gale and John’s. The menfolk, John and Craig, were shopping for tools in Yuba City’s Harbor Freight store when we arrived. They returned a bit later, and the six of us enjoyed a lovely afternoon catching up with one another’s happenings. Dinner had already been decided by consensus before we left home; we baked two Papa Murphy’s pizzas that we brought from home. There was so much it looked like there’d be cold pizza for breakfast – if anyone was so inclined. Dinner is served! And there was plenty of it – two pizzas were too much for the six of us, but John loves the stuff cold. 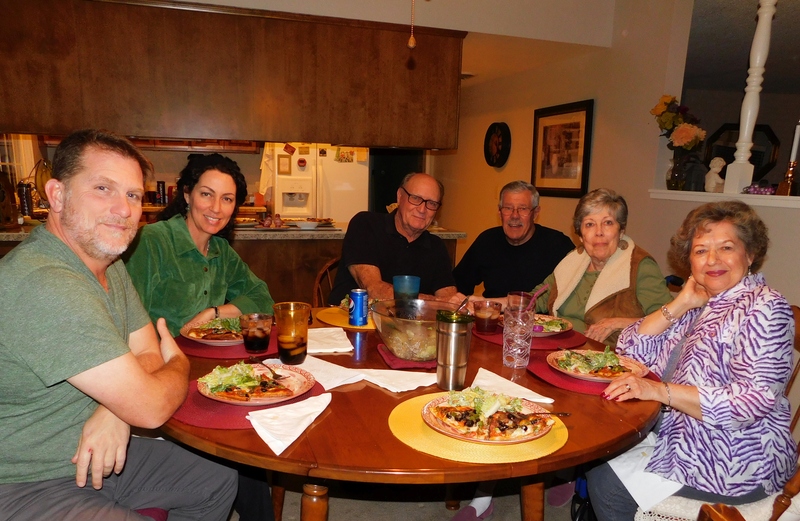 Pictured (L-R) Craig, Jill, John, the twins Dale and Gale, and Lavonne. I brought my laptop into the house and we spent some time looking over past family visits – thanks to this website which has become a family history of sorts. While I sometimes drive family members to distraction with my ever present camera at our get-togethers, this site is where we often turn for information from those past events. During the evening we were discussing whether Lavonne was at so-and-so’s funeral. I clicked up that event and… yep! There was Lavonne in one of the posted photos of that day! Dessert was, once again – and for the last time this year – strawberry shortcake. The little strawberry farm and roadside stand near our home was open for their final few hours of the season the morning we left, and Lavonne drove over for the last pickins’. The berries weren’t quite as good as usual, but still far better’n anything in the supermarkets! Dessert was strawberry short cake – and this was the last ’til next year because the little, nearby strawberry farm closed for the season after picking these very berries! A bit before 2000 hours, we bid everyone goodnight, and headed to our cozy little apartment in the driveway. It was a cool evening, and we had the heaters running for the first time this season. Lavonne and I spent time on our computers as we usually do. She spent some time perusing the web and I began this blog. We we very comfortable aboard Big Blue and slept well. It was another smokey day in the Central Valley. As of this writing, 29 deaths had been counted as a result of the Camp Fire, and unbelievable destruction was taking place about 30 miles north of Gridley. Ash fell on us from the smokey sky that morning, making that fire all too real. We enjoyed family time together for awhile, and the family, minus Lavonne and I, planned to go to church that morning. Still, we had time for John and I to drive to the local Mickey D’s for some breakfast fast food. We enjoyed the breakfast sandwiches and burritos as we sat around the table visiting. All too soon it was time for me to head back to the coach to make ready for the drive home. I powered in the slides, raised the jacks and rolled up the power cord. About 1000 hours we pulled out of the driveway and headed south for home through the smoke and ash. Our drive took us to the Walmart near Eight Mile Rd. in Stockton where we picked up our groceries for the week. We simply pulled into the “Grocery Pickup” area, and an employee of the store brought our order to the coach where I loaded it into one of the basement holds. We’ve been using Walmart’s online grocery program for over a year now, and it’s quite convenient – and it’s free! We awaited our “Walmart Pickup” order for the week’s groceries at the pickup area at a Stockton Walmart store as we headed home. We didn’t have to wait long, and it sure beat shopping for ourselves – and there is no extra charge for the service. Our entire drive was through smoke – this photo was taken along I-5 in Stockton, and smoke was worse there than in Gridley which was much nearer the fire. Strange! We arrived home a few minutes before 1300, and the skies seemed smokier in Stockton and farther south near our home than they were when we left Gridley. After unloading the groceries and our belongings from the coach, I dumped the holding tanks at the RV dump site in our community’s RV lot, then backed Big Blue into her covered RV space. We would be visiting Gale and John again in less than two weeks on Black Friday, the day after Thanksgiving. We planned to spend Thanksgiving at our son Craig’s place in Stockton, parking Big Blue in his driveway, then we’d head north to Gridley the next day. We plan to do the same at Christmas, too, as we usually do. We’ll also celebrate Gale’s and my 75th birthdays the day after Christmas with the family in Stockton – and again a few days later in Gridley with more family! Life is good with lots of family love – and visiting family often aboard Big Blue makes it even better!